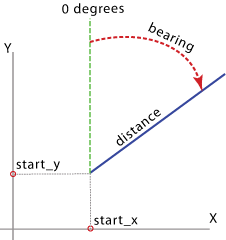 Each geodetic line is constructed using a particular set of field values representing the x and y coordinates of a starting point, distance from the starting point, and bearing angle measured from North. These fields and values will be included in the output. A numerical field in the input table containing the distances from the starting points for creating the output lines. The units for the values in the distance_field. A numerical field in the input table containing bearing angle values for the output line rotation. The angles are measured clockwise from North. The units of the values in the bearing_field. Converts bearing and distance info into a line.